Jayanagar Peeps, Have You Checked Out This Cute, All Vegetarian Cafe In Your Hood Yet? Baker’s 77 is a newly-opened bakery in Jayanagar that has bakes, cakes, and shakes, and a nice outdoor seating area where you can gobble it all up. Plus, everything is vegetarian here. 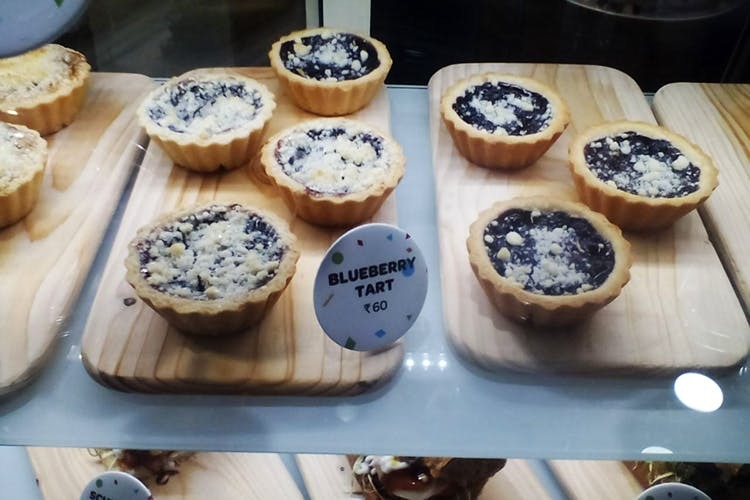 Located in 5th Block, Jayanagar next to Angadi Silks, Baker’s 77 is a small bakery that does cupcakes, cakes, bread, savouries, and pies. The shop is a small and cute place that literally has a single table with a bench and stools laid out outside. Inside, there are display sections of the cakes and bakes and there’s also a section for their baked bread and a section for their cupcakes, condiments and even some macaroons. They also have milkshakes on the menu! The cupcakes come in a bunch of flavours, including choco mint, watermelon, banana caramel and even unicorn colours, and are just INR 50 a pop. If you’re looking for something more substantial to satisfy the sweet tooth, you have to try the apple pie, which is crumbly, sweet and buttery, for INR 130. There are also small shot glasses of mousses and tiramisu and also they’ve got a variety of pastries. If you’re not in the mood for sweet, though, then there are some sandwiches and subs that you can chow on, including a basil pesto sub and a peri-peri sub, with marinated paneer and a lot of veggies and a choice of bread, including multigrain or whole wheat. If you want something to drink with all this food, order a hot coffee or a tea or maybe even a milkshake, from their wide choice. You can have fruity choices, like strawberry and banana or have an Oreo milkshake or maybe even a cold coffee. The food here is 100 percent vegetarian and eggless and they’re even aiming for some healthy food options with their subs. Baker’s 77 also offers condiments such as chocolate spreads, dried figs, almonds and more. You can even buy their freshly baked breads like focaccia, garlic bread or multigrain.